A romantic getaway for a just-married couple, an historic Baltimore restaurant, and a murder makes for a typical beginning for this 23rd installment of the author’s Krewe of Hunters series. The series focuses on a team of FBI agents, all whom possess to some degree abilities to see, hear, and interact with the dead, and use these special “gifts” to unravel murders that local police and other agencies cannot solve. What sets this novel apart from the rest of the series is the strange dreams, followed by waking encounters, with the ghost of a most famous historic personage, Edgar Alan Poe himself. Poe is a regular visitor to the Black Bird restaurant, which is dedicated to his life and work, and is the home of The Blackbird Society, a Poe fan group. When the restaurant becomes the scene of the murder of another, modern famous author, Poe volunteers to assist agent Griffin and historian and future-agent Vickie with the case. As the members of The Blackbird Society insist on “helping”, Griffin and Vickie cope with multiple séances, more murders and disappearances, and a trip to a house that could have come straight out of a Poe short story, “The Fall of the House of Usher.” As they unravel the clues to the modern murders, Vickie finds strange links between the modern cases and the mysterious circumstances surrounding Poe’s own death, which the ghostly author cannot consciously recall. 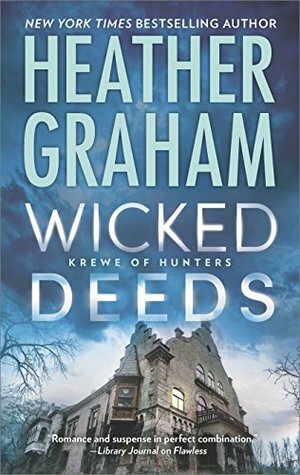 I thought this novel was by far one of the most engaging books by author Heather Graham I have read in some time. The premise of the story, while in lines with the successful series, contained more originality and twists and turns than some of the prior books in the series. Her protagonists are always likeable, but it is rare that the multiple secondary characters and antagonists, such as socialite and would-be seer Liz Harcourt, are portrayed with such depth of development. The characterization of Poe himself was equal parts comic-relief and intrigue that makes the reader ponder the various theories concerning his mysterious demise. The only issue I had with Wicked Deeds is in the final chapter, which seemed overly drawn out and forced in length. While it was nice to see the characters have some closure, this particular scene seemed a little superfluous, especially after the level of excitement that preceded it. Still, I thoroughly enjoyed the rest of the book, and give it five stars, with recommendations for any reader who enjoys paranormal/urban fantasy/murder mystery/romantic stories.